...and high pressure that, parked nicely over Scandinavia, looks set to dump a load more easterlies and their passengers on the English east coast in the coming days. More of which anon. First things first, and we need to go straight for the jugular – as wishfully hinted at last week, something lovely made landfall on the back of Hurricane Joaquin and the assorted tropical storm mid-Atlantic shenanigans of the past week. So there we all were on Tuesday afternoon, thinking that this had been yes, a good week for eastern vagrants, but no, not the week that I’d concluded last week’s Round-Up by predicting it was going to be for serving up an absolute howling monster of a rarity. For most folk that would have been mildly disappointing – we all love a good rare American warbler, after all – but for me it mostly meant I was going to spend the latter part of Tuesday counting Yellow-browed Warblers and Richard’s Pipits. The birding gods and, specifically, Roy Dennis and Tony Marr on Lewis, had very different ideas indeed. And so it was that on the afternoon they (I’ll assume the birding gods, not the birders in question, who probably phrased the actual moment of discovery rather more colourfully and fragrantly) spoke thusly, and said, “I know, we’ll drop a Wilson’s Warbler on Lewis in the Western Isles and see how that pans out”. And that’s just what happened. To put this bird into perspective, this is Britain and Ireland’s third ever record of Wilson’s Warbler. The most recent was, of course, in living birding memory, only two years ago – the first-winter male that spent 18th-21st September 2013 on Co.Cork’s Dursey Island. And the very first one? Yes, that’d be the male on Rame Head in Cornwall exactly 30 years ago to the day, present there on 13th October 1985. Funny old thing, birding – it often seems to chuck up these strange coincidences of timings and suchlike. 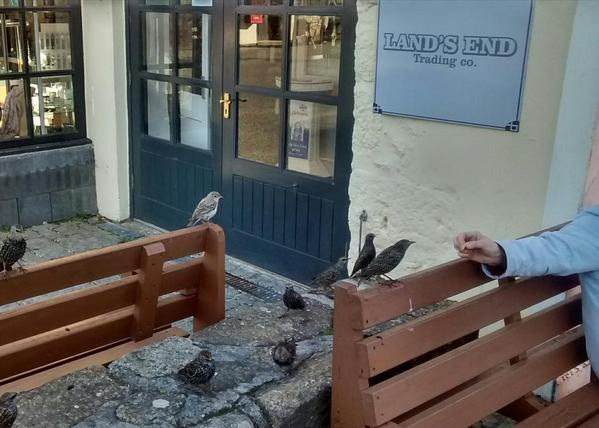 There’s no place for such whimsy here though – the Dursey bird was, theoretically at least, available for four days compared to the Cornish bird’s single, pre-RBA-connected day. To all intents and purposes the Dursey bird was the first available one. But not everyone would countenance a twitch to Ireland, for reasons of expense or listing politics. Scotland may, for whatever reasons, rightly or wrongly, appeal a little more as a twitchable prospect. But… and it’s a big but… American wood warblers don’t tend to stick around for long. Especially not the really monster ones. There are of course exceptions to the rule – take the Unst Cape May Warbler as a case in point – but time alone will tell whether this latest Wilson’s Warbler is going to play ball. At the time of writing, late on Tuesday, it was still at Port Nis near Café Sonas in the late evening as night fell, but was reported to be elusive. 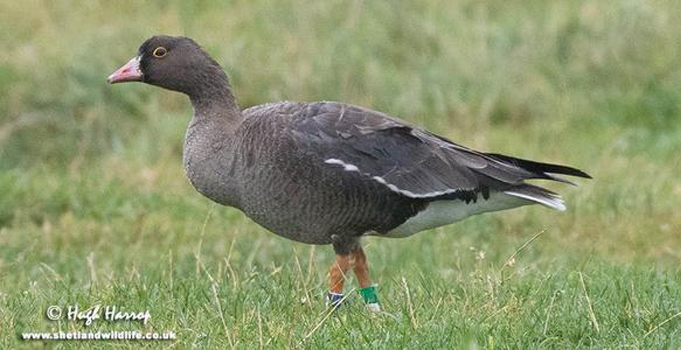 Scotland’s first record, Britain’s second, Britain and Ireland’s third… And to cap all that, it’s a black-capped male. Gentlemen, start your engines! The first major scalp of the new week’s birding didn’t fall, as expected, to Shetland or indeed anywhere on the east coast. Step forward none other than Gloucestershire, where on 8th a juvenile Little Crake appeared at Slimbridge WWT. While this diminutive crake doesn’t, on paper, seem like the rarest of birds – with over 100 previous British and Irish records – the bald stats obscure the real status of Little Crake nowadays: two thirds of those records hail from before 1950. In the past few decades this has become a properly rare vagrant, and one that’s far from annual. Gloucestershire has only two previous records to the county’s name, both of which were at Slimbridge – one back on the very cusp of the 1950s (22nd-29th April 1951) and one in latter days during September 14th – October 2nd 2005. So when all’s said and done, this is a properly rare species at a county and a national level, and one that duly attracted some admirers from near and rather further afield. County listers could be forgiven for feeling a touch ungrateful though, as the one and only Baillon’s Crake for Gloucestershire was killed near Gloucester at some vague point, precise date unknown, way back in 1882... The next one is keenly anticipated! A favourite eastern vagrant with Scilly regulars made a welcome reappearance on St.Mary’s airfield in the late afternoon of 8th – a cracking Isabelline Wheatear. The last one on the archipelago was back in 2007 so it’s almost been a decade in the waiting – long enough for a new batch of Scilly October birders to have keenly anticipated the next record, and sufficient absence for the hearts of long-term visitors to have grown fonder of this most subtly attractive of wheatears. Only Britain’s 33rd record of this species to date (Ireland has just the one on the books), Scilly enjoyed a flurry of records in the late 1980s and early 1990s - 2nd-3rd October 1988 on St.Mary’s; 18th October – 2nd November 1990; and 15th-26th October 1991 on St.Agnes and Gugh – before the aforementioned 2007 individual on St.Mary’s on 3rd October. That 50/50 split of long-stayers and short-stayers on the islands gave no clue as to what this latest bird would do. Would it stay or would it go? Alas, as Friday dawned with no sign of the bird, it became all too clear that this particular bird wasn’t hanging around for the weekend’s new intake of birders... Still, despite the highly encouraging south-easterly storm that had battered Shetland as the week began, it was Scilly that went into the weekend wearing the week’s laurels for the best bird to date, albeit an all too brief one. A possible Blyth’s Pipit was on St.Mary’s (Scilly) on 10th near Salakee, but wasn’t subsequently pinned down. Could this however have been the bird that was found in the late afternoon of 13th a little way across the island on the west side of Peninnis Head. Just like the very first bird in 1993, news broke on 13th as the light was fading. There’ll be birders who, just as we did back then, will have spent an anxious night fretting about whether the bird will still be there in the morning. At the time of writing this late on Tuesday evening I’m not finding much joy in my crystal ball to see how that’s panned out. By the time you’re reading this, we’ll know if a new batch of Scilly birders have caught up with a Blyth’s. 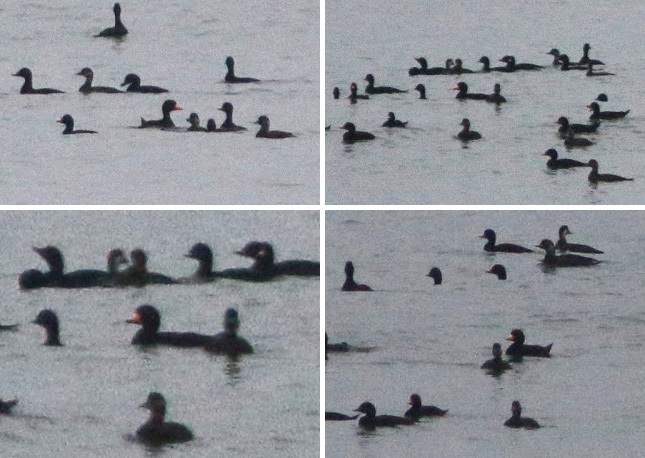 First found on 8th January 2015, and present there until 3rd April, we could have been forgiven for thinking that Co.Kerry’s Rossbeigh had done alright this year for Black Scoter. Not only Ireland’s first record of the species, but a spanking adult drake to boot. It was all good. Quite where it’s been in the interim is anyone’s guess, but he was back there again this week, being seen there on 10th-11th providing anyone who’d somehow not found the time to catch up with him earlier in the year with the incentive to go and have a speculative look at Rossbeigh sometime in the near future. If only all rarities were as site-faithful as scoters, and as tough as ducks generally. You wouldn’t catch any of this week’s star passerines being anything like as obliging as this dapper duck. Where last week we found things quietening down after the usual late summer / early autumn goings on, this week in Seawatchingland (it’s like Dismaland, but with added eyestrain) was notably quieter still. The week all started so promisingly for Balearic Shearwaters, with 42 birds logged off Pendeen (Cornwall) the cream of the day’s crop – Dorset’s Portland added a further English pair that day, while in Wales a pair were off Bardsey (Gwynedd) and a half dozen were off Strumble Head (Pembrokeshire). So far, so good – and those 42 Cornish birds had already singlehandedly exceeded last week’s total showing for the species. However, bar a couple of singleton stutters on 9th (one off Bardsey again and one seen some 60 miles south of Great Saltee Island (Co.Wexford), one off Orford Ness (Suffolk) on 11th, and singles past Cley and Happisburgh (Norfolk), Whitburn Coastal Park (Co.Durham) and Spurn (East Yorkshire) on 13th, that was our lot for the week. Suffolk raised the shearwater game somewhat with at least two Cory’s Shearwaters heading north along the coast on 10th – two singletons were seen passing Southwold, with one noted off Lowestoft. Sticking with Suffolk that day, here too came the bulk of the week’s Leach’s Petrels - single records coming from Bawdsey, Lowestoft and Southwold on 10th, with one seen from Orford Ness on 11th. One was noted from Happisburgh (Norfolk) on 13th. Heading into the skuas, Pomarine Skuas were on the move still, particularly in the first half of the week. On 7th two passed Bardsey (Gwynedd) , two were off Dungeness (Kent) – with a single seen off there on 8th and 9th also – and two passed Filey (North Yorkshire). Further singles on 7th were off Pendeen (Cornwall), St.Mary’s Island (Northumberland) and Tarbat Ness (Highland). 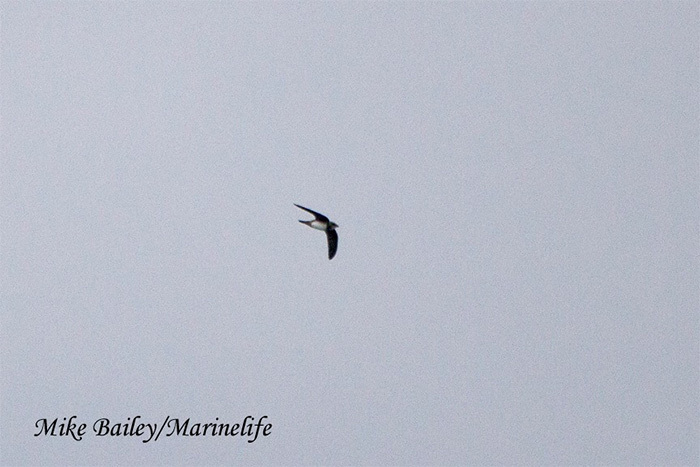 One was off the latter site again on 8th, with one seen that day from Flamborough (East Yorkshire). 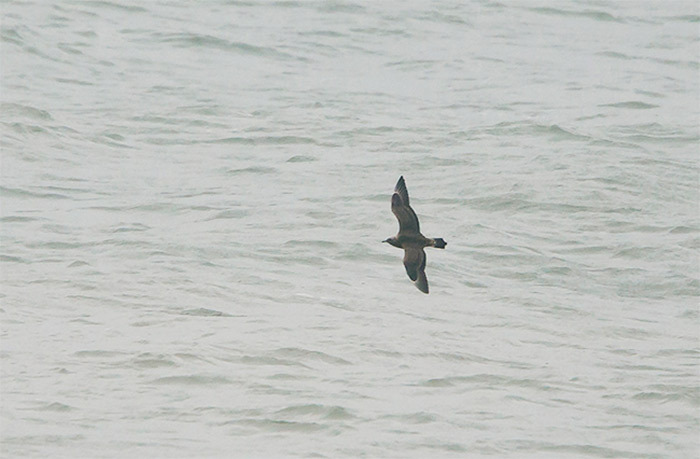 On 9th one was seen at sea 60 miles south of Great Saltee Island (Co.Wexford). On 10th two were noted from Flamborough, while on 11th another Irish at sea record came some 3 miles south of the Minehead lighthouse (Co.Waterford), with singles that day off Seasalter (Kent) and Gibraltar Point (Lincolnshire), three off Whitburn Coastal Park (Co.Durham), and five off Shell Ness (Kent). On 12th one was noted from Long Nab (North Yorkshire) with three that day off Craster (Northumberland) and two in the Sound of Raasay (Highland). On 13th six passed Whitburn Coastal Park (Co.Durham), three were off Saltfleetby NNR (Lincolnshire), three passed Holme Dunes NWT and singles passed Cley (Norfolk), Spurn (East Yorkshire) and Hunmanby Gap (North Yorkshire). Long-tailed Skuas meanwhile were in short-supply, with singles noted on 7th from Pendeen (Cornwall) and Fishtown of Usan (Angus); from Flamborough (East Yorkshire) on 8th; and at sea some 60 miles south of Great Saltee Island (Co.Wexford) on 9th. On 10th three were seen passing Southwold (Suffolk) and on 13th one was off Cley (Norfolk). I’m not really sure what to say about the colour-ringed Lesser White-fronted Goose that tootled around the fields of Quendale Farm (Shetland) on 7th-9th. While in some quarters it appeared to be taken seriously, for all it had flown here under its own steam it was, when all was said and done, a somewhat plastic bird – the offspring of wild-caught Russian birds, this individual had been released in Swedish Lapland on 8th July 2015 as part of the National Swedish Action Plan for the species’ recovery. It was always on a hiding to nothing though – far more ostensibly wild wildfowl in Shetland have been deemed unworthy - Wood Duck anyone? More exciting goose action came from the Scottish mainland this week, with a couple of white Snow Geese to report – in the Findhorn Bay area of Moray on 7th-10th, and at Caerlaverock WWT (Dumfries & Galloway) on 7th-11th – and a blue morph on 12th at Fishtown of Usan (Angus). Down in Devon the minima Ridgway’s Cackling Goose remained with its Dark-bellied Brent Geese chums on the Exe Estuary at Exmouth until 13th. Also present here was the adult Black Brant again on 10th; another was seen earlier in the week at Frampton Marsh RSPB (Lincolnshire) on 8th with a possible further bird (or a hybrid) at Wells-next-the-Sea (Norfolk) on 13th. A possible Cackling Goose was at Loch Gruinart on Islay (Argyll) with Barnacle Geese on 13th. Hertfordshire’s drake Ring-necked Duck remained this week at Startop’s End reservoir until 13th. The Ferruginous Duck was still at Blashford Lakes HWT (Hampshire) on 13th. Drake American Wigeons were again in Orkney at Loch of Ayre on 11th-13th and in Ireland Tacumshin (Co.Wexford) on 9th-11th. A further Orcadian record came from South Ronaldsay on 12th. A drake Green-winged Teal was at Martin Mere WWT (Lancashire) on 11th. The first of, doubtless, many more in the coming weeks and months. With the week’s most exciting scoter news already despatched in the headlines, we find slim pickings where Surf Scoters are concerned – the drake was again in Lunan Bay (Angus) on 8th-13th, while one was with its rarer cousin off Rossbeigh (Co.Kerry) on 10th-11th. A possible King Eider female flew past Corton (Suffolk) early in the morning of 11th. Once again plenty of variety amongst our shorebirds this week though, with many of last week’s species figuring prominently again albeit sometimes in new locales, it was a bit of reshuffle of the hand we’d already been dealt and less new cards from the pack. The Isle of Wight Greater Yellowlegs reappeared in the news on 11th and again on 13th after an absence of several days, being reported once again from the River Medina at Whippingham. In Ireland on the Muckross Estuary (Co.Cork) the Lesser Yellowlegs was still present until 8th. This week it was Cornwall’s turn to enjoy a Marsh Sandpiper, with one turning up at Nanjizal Valley on 9th. This site’s regulars appear to have enjoyed a particularly good year this year... This juvenile Marsh Sand shared Nanjizal on 9th with a OBP. Not a bad day’s work! And even more impressive when one realises that there are no accepted records of the species for the county, making this not simply a terrific site-tick but a county first to boot. The juvenile Semipalmated Sandpiper remained for another week at Slimbridge WWT (Gloucestershire), hanging out there until 13th. 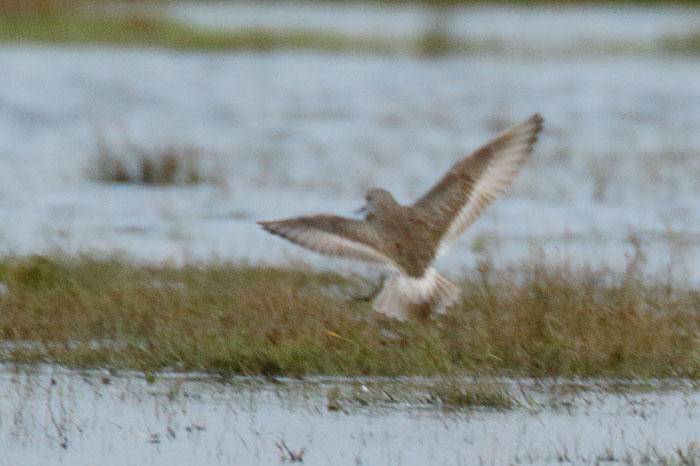 An adult White-rumped Sandpiper was at Weybourne (Norfolk) on 7th before flying west. Presumably the same bird was at Cley on 10th and 12th. The Hampshire Long-billed Dowitcher remained settled at Pennington Marshes until 13th. Nine American Golden Plovers were logged this week though not, despite my best efforts with my local Goldies, anywhere near home. The sole Shetland representative was the settled bird on Yell at Cullivoe until 11th. Elsewhere, 10th heralded something of a surge for the species with no fewer than six records coming that day, headed by two birds at Kilnsea (East Yorkshire), one of which was still in the area on 13th. Elsewhere singles were on South Uist at Bornish (Western Isles), at Aberlady Bay (Lothian), in Cornwall at Windmill Farm NR (until 12th) and in Co.Clare at Loop Head. A further Irish bird was in Lurgan Bay (Co.Louth) on 11th, while one was again at Ballycotton (Co.Cork) on 12th-13th. A far better showing of Pectoral Sandpipers this week, with more than double what we saw last week with twelve birds logged in all. The week kicked off with an unconfirmed report of the individual again at Adwick Washlands RSPB (South Yorkshire) on 7th, and the bird still in Cheshire at Burton Mere Wetlands RSPB on 8th-12th. 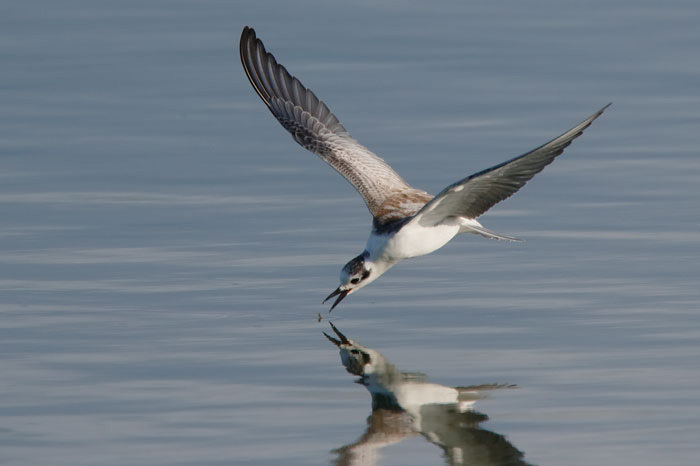 New birds were found on 7th at Ham Wall RSPB (Somerset), on Inishmore (Co.Galway), Carrahane Strand (Co.Kerry) and at Titchwell RSPB (Norfolk) – with both the latter two birds present at their respective sites until 9th. 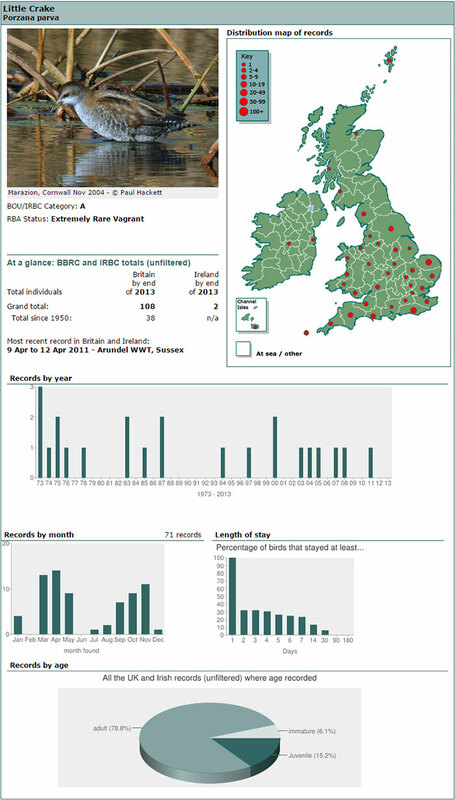 On 8th-10th one was logged at Cley (Norfolk) while on 8th-11th one was at Nosterfield Quarry (North Yorkshire). On 11th a further individual was seen at Grindon Lough (Northumberland). On 13th two were at Carrahane Strand (Co.Kerry), and singles were at Tacumshin (Co.Wexford) and Pennington Marshes (Hampshire). Dursey Island (Co.Cork) was where it was all at this week for Grey Phalaropes, with no fewer than seven logged there on 8th. Elsewhere however it was all about the singletons – one was seen from the Scillonian on 8th, one was off Scilly’s Northern Rocks on 9th and near Bishop Rock on 12th. A pelagic off Inishbofin (Co.Galway) yielded two more on 11th while there were two that day off Tiree (Argyll). On 13th one passed Bawdsey (Suffolk). 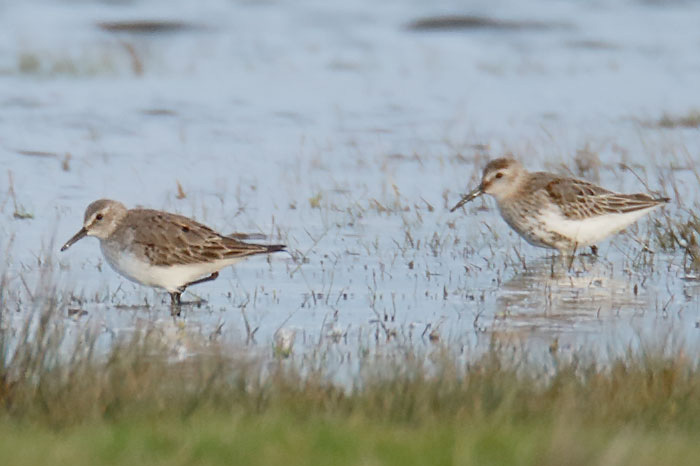 North Ronaldsay (Orkney) hosted a Temminck’s Stint on 10th-11th. Another was at Swillington Ings (West Yorkshire) in the morning of 13th. The Dotterel remained at Cullivoe on Yell until 9th; one was at Ballycotton (Co.Cork) on 11th. A juvenile White-winged Black Tern significantly enhanced Cantley Beet Factory (Norfolk) on 7th-8th. Another juvenile was seen at the tail end of the week at The Mere (Shropshire) on 12th-13th. The adult Bonaparte’s Gull remained on the Lossie Estuary (Moray) until 12th. Cornwall’s Hayle Estuary supplied the second-winter Ring-billed Gull again this week on 10th and 12th. The only other record of the species came from Ireland where one was at Blennerville (Co.Kerry) on 8th. On 8th single Iceland Gulls were noted on Westray (Orkney) and at Tweedmouth (Northumberland); on 9th one was seen on Barra (Western Isles); while on 10th one was at Ballycotton (Co.Cork). The winter’s first Kumlien’s Gull, a second-winter bird, was at Mizen Head (Co.Cork) on 10th-12th. Wrapping up the gulls and terns we come to Sabine’s Gull - a fine adult was seen off St.Margaret’s at Cliffe (Kent) on 10th, with one also past there on 11th. A further adult bird was reported past Gunton Cliffs (Suffolk) on 11th. 13th brought an end of week flurry of records, with birds seen from Bardsey (Gwynedd), from Lincolnshire’s Freiston Shore RSPB and Saltfleetby NNR, and in Norfolk where a juvenile passed Weybourne and two were seen from Holme Dunes NWT. The tremendous adult male Northern Harrier remained on Orkney’s North Ronaldsay until 13th. Former North Ronaldsay resident birder and rarity finder extraordinaire Martin Gray chalked up a tremendous garden tick on the Orkney mainland at Voy with a juvenile Pallid Harrier there on 9th and again on 11th. The juvenile Pallid Harrier remained at The Burgh (West Sussex) until 10th, with a probable sighting again on 11th. One was seen from the Isle of May (Fife) on 10th and, presumably involving the same bird, again on 12th. A further probable was seen at Thurton (Norfolk) on 12th, while a ringtail of either this species or Montagu’s Harrier was over Waxham Sands (Norfolk) early on 11th. The year’s trickle of Red-footed Falcon continued this week with a couple of east coast records as the week kicked off – one at Spurn (East Yorkshire) on 7th, and one at Minsmere RSPB (Suffolk) on 8th. Honey Buzzards continued to be reported this week, though numbers are now starting to fall away with just eight logged – two birds over Kent’s Westwood Cross on 7th, with one that day in Norfolk over Docking; on 10th single birds over Haywards Heath (West Sussex) and Dursey Island (Co.Cork); and on 12th one was over New Romney (Kent). On 13th one flew over Portland (Dorset) in the afternoon, with a further Kentish record that day from Chartham. Where the Honey Bs are waning, the Rough-legged Buzzards are now on the rise – the week began with one seen at the species’ favourite haunt of Breydon Water (Norfolk) on 7th, with another reported at Burpham (West Sussex); on 8th one was in Shetland at West Sandwick on Yell; on 9th a juvenile was reported from Cardurnock (Cumbria); and on 12th a juvenile was at Clayhanger Marsh (West Midlands) and one was reported over Harrington airfield (Northamptonshire). Our soar through the week’s rare and scarce raptors concludes with a Black Kite seen on 8th over Kirby-le-Soken (Essex). We’ve masses to get through, so now’s the time to make a cuppa, crack open the chocolate biscuits, and take our time. With loads of variety and some decent lookers amongst them, it could even be a Jaffa Cake-worthy week. Kicking off then where we left off last week, the Alpine Swift remained on Little Orme (Conwy) on 7th. Proving this was far from a flash in the October pan were two more on 10th – one seen at sea south of Plymouth (Devon), and an ill-fated bird that spent the day scything around the Land’s End area before almost certainly being nailed by a Merlin in the evening. (Cornish and Scillonian Merlins were having a busy and varied week – one accounted for a Red-backed Shrike on St.Agnes on 11th). Also reported from the same Cornish airspace as the Alpine Swift in the afternoon of 10th were two possible Pallid Swifts - a classic late October vagrant, there was no further sign of these two later on in the day. Numbers of Wrynecks picked up this week, with the total inching towards double figures – the week began with birds at Littlestone-on-Sea (Kent) and on St.Agnes (Scilly), with presumably the latter bird still there again on 10th; on 8th one was at Ocraquoy (Shetland), with southwestern records from Gugh (could this have been the St.Agnes bird?) and Porthgwarra (Cornwall). One was seen at Cornwall’s St.Buryan on 9th, while one was up-country at Pennington Marshes (Hampshire) on 10th-11th. Back in Cornwall, on 11th one was seen at Sennen and one was again at Porthgwarra on 12th. A single bird was seen on 12th at Lowestoft (Suffolk). The week’s only Irish record came from Mizen Head (Co.Cork) on 11th. Heading into the shrikes, my prophetic words last week about an Isabelline Shrike being an imminent arrival were amply borne out on 11th when a first-winter bird was discovered in Norfolk near Beeston Regis. Norfolk was having a bit of a moment on 11th, as we’ll see shortly, but this probable isabellinus ‘Daurian Shrike’ was arguably the cherry on the cake’s icing. Since the county’s first Issy at Holkham Meals on 12th-13th October 1975 Norfolk birders have enjoyed a half dozen further records culminating in the last one at Horsey in the final week of October 2011. Nationally they’re pretty much annual, and in good years we often see multiple arrivals – given the forecast for the coming week at least, one wouldn’t bet against another somewhere along the east coast. This particular bird remained there until 13th. Returning to their commoner brethren, numbers of Red-backed Shrikes crept towards double figures this week. Single birds were logged on 7th-8th at Easington (East Yorkshire); on 8th on Westray (Orkney); on 9th-11th on Shetland at Ollaberry; on 10th on Scilly on St.Martin’s and St.Agnes (with the latter ill-fated bird there until it became a Merlin’s dinner on 11th) and on Portland (Dorset); and on 11th-13th on Mizen Head (Co.Cork). On 7th-10th one was in Gwynedd near Porthmadog; while one was found that day in Cambridgeshire at Ouse Washes RSPB. One was on Shetland at Hoswick on 8th, with further Northern Isles arrivals on South Ronaldsay (Orkney) on 8th-9th, at Baltasound on Unst (Shetland) on 8th-10th and on North Ronaldsay (Orkney) on 8th-13th. Shetland continued to feature largely in the next few days with birds at Boddam on 9th, Cunningsburgh on 10th, Bigton on 11th, Whalsay on 11th-12th, Foula on 12th and Bressay on 13th. Further English records came from Lowestoft (Suffolk) and Flamborough (East Yorkshire) on 11th, with further birds on Gibraltar Point (Lincolnshire) on 11th-13th and Holy Island (Northumberland) on 11th-12th. Norfolk scored a brace on 12th with individuals at Caister-on-Sea and Little Snoring; Suffolk featured a bird that day at Landguard NR, while East Yorkshire delivered at Easington on 12th-13th. On 13th one was at Braintree (Essex), with one at Pegwell Bay (Kent) also. Siberian Stonechats popped up into the news with two arrivals during the week – one a relatively straightforward record, a bird at Quendale on Shetland on 12th-13th – and one a somewhat more problematic kettle of fish altogether. There would, doubtless, have been many who would have welcomed a chance to see this latest individual particularly as, like the Dorset bird beforehand, there’s a high probability that there’ll be subsequent DNA validation of the provisional identification. As it happened, there was no sign of the Suffolk bird there the following day – potentially just as well, as there wasn’t to be public access to the site for another week. Scraping into the news last week on the basis of one bird in Orkney, this week Red-flanked Bluetails roared with seven or eight birds tallied. For veterans of the Winspit bird in 1993 the subsequent change of fortunes for this gorgeous and once monstrously rare species are hard to conceive. None of us who tried to battle the bitter cold and the adrenalin inspired by this mythical bird for a precious few hours of rough sleep in the Winspit car park could have foreseen just how pointless that uncomfortable night was going to become! The week began with a record on 7th from the species’ former stronghold, Fair Isle (Shetland). So far, so good... Things kicked off on 11th with another sighting from Fair Isle – a different individual, or the same one lurking unseen in some hidden recess? – and one further down the east coast, trapped and ringed at Weybourne (Norfolk). Cream of the crop on 11th though was one much, much further west – the Scilly season was properly under way this year when, hot on the heels of a certain wheatear, news broke of one on St.Agnes on 11th. Just the fourth for the archipelago following two in 2008 and one in 2010, this showy individual was a welcome fillip for the Scilly faithful and remained until 13th. Onto 12th, and it all went bluetail-bonkers on the east coast... 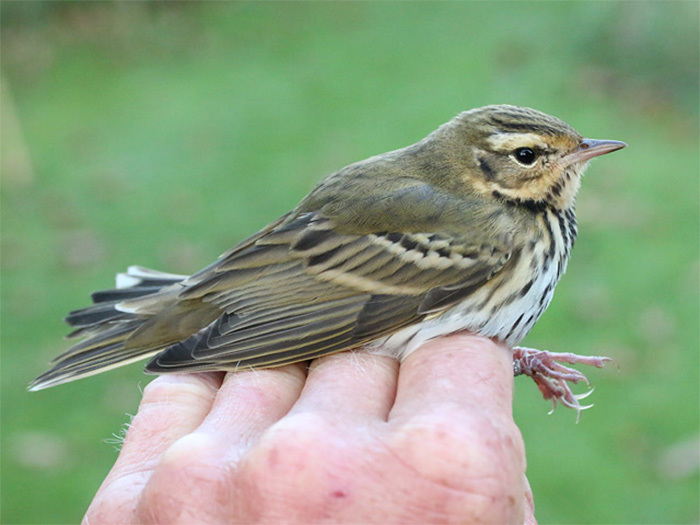 In East Yorkshire one was on Flamborough Head (until 13th) and one was trapped and ringed at Kilnsea (still there on 13th also), while in Norfolk one was sharing Holkham Pines with Dusky and Radde’s Warblers. This latter individual remained there on 13th also. Orkney scored the second of the autumn for the islands with one at Sandside Bay on 12th. The times they have indeed changed. Where once Red-flanked Bluetail was the stuff of dreams, one could always rely on a dusting of Bluethroats. Yet as we all know, the latter has become much scarcer of late in spring as well as autumn. During the past week it was (just) outnumbered in the UK by those bluetails... Single birds were on North Ronaldsay (Orkney) on 7th-12th, and Fair Isle (Shetland) on 8th-12th; in Shetland on Unst and Foula on 10th; in East Yorkshire on 11th at Thornwick Bay and on 12th at Spurn; and at Whitburn Coastal Park (Co.Durham) on 12th. On 13th one was again at Quendale (Shetland) while two were on Fair Isle. A slight reduction this week for the always charming Red-breasted Flycatchers, with around 15 birds recorded. Barra (Western Isles) kicked things off with sightings on 7th and 12th; Shetland returned one at Loch of Benston on 8th, with another reported that day from Start Point (Devon). Cornish records came on 9th from Rame Head and Porthgwarra, with one on Cape Clear (Co.Cork) that day also. One was on Foula (Shetland) on 10th, with one also at Holkham Pines (Norfolk); on 11th the north-east coast delivered single birds on Holy Island (Northumberland) and Flamborough (East Yorkshire), with two birds at the latter site the following day. Back in the southwest on 11th one was found on Scilly on St.Agnes. Scotland returned three birds on 12th – singles on North Ronaldsay (Orkney), South Uist (Western Isles) and the Isle of May (Fife). On 13th Fair Isle (Shetland) scored two birds. Easterly winds at this time of year always raise the possibility of a Pechora Pipit - there was a certain inevitability therefore to the one found on Foula (Shetland) on 10th. Shetland is, after all, the species’ stronghold with almost every British record hailing from there. North Ronaldsay (Orkney), so long in the shadow of its northerly neighbour(s), got a look-in on 13th with one a good find in the island’s immense iris beds. What was presumably the bird from the last week was again at Melby (Shetland) on 13th. 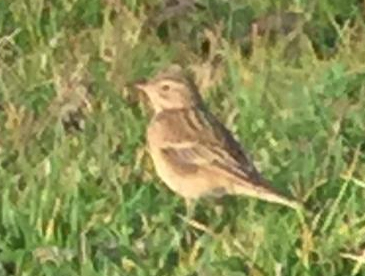 Just three Red-throated Pipits were found this week, one in Ireland at Carrahane Strand (Co.Kerry) on 8th-9th, one at St.Abb’s Head (Borders) on 11th, and one on 13th on St.Mary’s (Scilly). Olive-backed Pipits meanwhile were a particular feature of the week – Shetland, as ever, enjoying the lion’s share of these. One remained there in Lerwick until 8th, while there were two on Fair Isle on 8th, with one there on 12th and two on 13th. Elsewhere on 8th one was at Vidlin, with another at Tresta on 8th-11th. 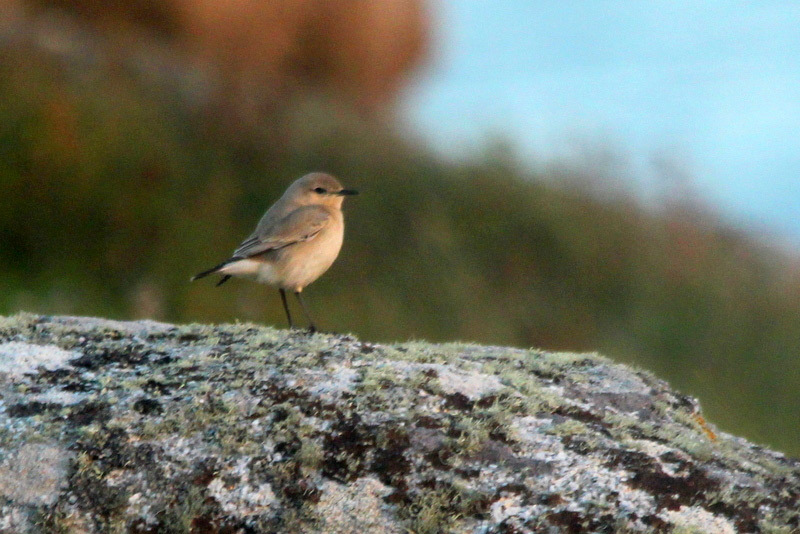 On 9th-11th one was on Unst at Norwick, with another on Unst at Baltasound on 12th. One was at Toab on 10th, with one on Foula on 10th-12th. Two birds were at Quendale on 11th, with one still there on 13th. Away from Shetland on 9th individuals of these smart pipits were found on Flamborough (East Yorkshire) and in the rarity-magnet that’s Nanjizal Valley (Cornwall). One was at Spurn (East Yorkshire) on 10th; another was on the Isle of May (Fife) on 11th; and in Orkney North Ronaldsay’s good week for pipits continued with one on 12th. One was identified from a sound recording in Dorset on 12th at Ballard Down; one was trapped and ringed in the county at Portland on 13th. 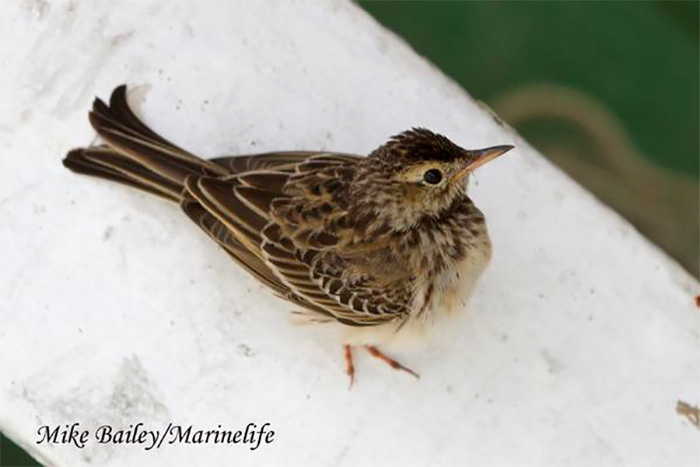 Which pipit news brings us to the enormous mass of this week’s Richard’s Pipits. Last week’s tally of around 30 birds was contemptuously screwed up into a ball and tossed into the corner of the room with north of 50 birds reported this week from all around the country. While many were single birds, there were multiple sightings too for a third consecutive week at a national level – numbers at Burrafirth on Unst (Shetland) peaked with three there on 8th, with two on the island at Baltasound on 10th (and one for good measure at Haroldswick on 10th-11th); while on Fair Isle numbers peaked with four there on 9th; and there were two on Foula on 10th. Away from Shetland, Barns Ness (Lothian) had two on 10th; two were over Wells Woods on 11th and in fields at Wells-next-the Sea (Norfolk) on 12th; and Kilnsea (East Yorkshire) a pair on 12th also. The remaining singles were scattered across 15 English, three Scottish and three Welsh counties, with Ireland returning records from Bolus Head (Co.Kerry) on 8th, Galley Head (Co.Cork) on 11th, Loop Head (Co.Clare) on 13th and even from some 40 miles out to sea off Hook Head (Co.Wexford) on 9th. This latter wasn’t the week’s only at-sea record – another badly lost pipit was 35 miles off Prawle Point (Devon) on 8th. To reprise last week’s Yellow-browed Warbler refrain, just how many birds were actually involved in this influx, and how many went unseen and unheard? In stark contrast to this largesse, there was just the one Citrine Wagtail this week, at Spurn (East Yorkshire) still on 7th. Like Common Rosefinches there don’t seem to be as many of these this autumn as we’ve become accustomed to in recent years. A probable Short-toed Treecreeper in East Sussex in Hastings CP on 9th never quite firmed up enough to elevate it to the headlines. On Scilly, that short-toed staple of a Scilly autumn was a fixture at the airfield on St.Mary’s every day from 8th – a Short-toed Lark. The regular juvenile Rose-coloured Starlings remained at Porthgwarra and Land’s End (Cornwall) until 9th and 13th respectively; with the adult a little further east still on The Lizard until 10th. The adult was again on Islay at Loch Gorm (Argyll) on 13th. The juvenile in Tewkesbury (Gloucestershire) remained until 11th, and a new bird was in Ireland at Mizan Head (Co.Cork) on 11th-13th. And so to the warblers - and this week, rather than build the suspense unnecessarily, we’ll get the ongoing barrage of Yellow-browed Warblers out of the way early on. For a third consecutive week we were deluged by them – my conservative tally of the week’s reported birds comes to around 700 individuals, but that’s inevitably a gross underestimate of what was really out there, in seemingly every coastal county and not a few western and inland localities as well. Did you find one for yourself? It genuinely felt like it would have been hard not to last week. And I bet we haven’t seen the last of them – there’s going to be plenty more this coming week. Headlining the rarer warblers is, inevitably, the Lanceolated Warbler trapped and ringed on Fair Isle (where else?!) on 12th. Shetland’s near monopoly continues – but with the forecast for the coming few days surely some will make landfall further south on the English east coast? And what about a Pallas’s Grasshopper? There have been some false alarms in the past few weeks, but the real deal feels overdue now. ...at times on 12th sharing the pines with a funky Radde’s Warbler that had been there since 11th. This Radde’s had been preceded by one on Holy Island (Northumberland) on 8th, and was bookended by further birds on 12th at Great Yarmouth cemetery (Norfolk) and trapped and ringed at Kilnsea (East Yorkshire), with a further possible bird in Norfolk that day at Snettisham CP. One was trapped and ringed on St.Mary’s (Scilly) on 13th. Equally anticipated at this time of year are Pallas’s Warblers - and in the second half of the week a small fall of these delightful six-striped sprites made landfall. One was at St.Osyth (Essex) on 8th, but it was 11th onwards when the real numbers came. On 11th single birds were at The Naze (Essex), Sheringham (Norfolk), trapped and ringed at Orford Ness (Suffolk), and on 11th-12th at Dungeness (Kent) and Easington (East Yorkshire). On 12th further birds were in Wells Woods (Norfolk), Saltfleet (Lincolnshire) and in Cornwall at Pendeen (until 13th). On 13th in Norfolk one was heard in Muckleburgh Hill and a further report came from Holkham Pines. A possible Arctic Warbler was in Shetland at Quendale on 8th. Confirmed birds were on The Garrison on St.Mary’s (Scilly) on 11th-12th, and Inishmore (Co.Galway) on 11th. The secretive Eastern Subalpine Warbler popped up again at Mossbank (Shetland) on 11th-13th. Elsewhere in the islands a Paddyfield Warbler was on Fair Isle on 8th, with a possible further individual on mainland Shetland at Ollaberry on 10th – though with the finder not excluding Sykes’s Warbler this one was best consigned to the one that got away. We’ve all had ‘em. Shetland’s run of Blyth’s Reed Warblers continued – were the individuals at Exnaboe on 12th and Quendale on 13th new arrivals or some of the previous birds in the south mainland popping out of the woodwork anew? One was in Norfolk on 11th at Kelling, with one at Wells Woods on 13th. A probable Siberian Lesser Whitethroats, form blythi, was trapped and ringed on 12th at Stanford reservoir (Northamptonshire). More on that, I’m sure, in due course. A further probable individual was at Noss Head (Highland) on 13th. A possible Melodious Warbler was on Scilly’s Bryher on 8th. And that brings us to the last chunky slice of warblers – your week’s Barred Warblers. Hangers on from last week remained on St.Mary’s Island (Northumberland) until 9th and Firkeel (Co.Cork) until 13th. One was at Collieston (Aberdeenshire) on 7th; fresh arrivals on 8th were in Shetland at Hoswick – until 11th - and Noness, on South Ronaldsay (Orkney) and Sammy’s Point (East Yorkshire) - until 10th. On 9th Filey (North Yorkshire) and Land’s End (Cornwall) had a bird apiece; and on 10th it was the turn of Mull Head (Orkney) and Vatersay (Western Isles). A fresh surge came in on 11th, with singles in Shetland on Unst at Baltasound and on Fair Isle; one trapped and ringed at Bamburgh (Northumberland); at Kingsbarns (Fife) and in Ireland at Mizen Head (Co.Cork). On 12th one was on Papa Westray (Orkney). On 13th individuals were found at Skateraw (Lothian), Wells-next-the-Sea (Norfolk), on Holy Island (Northumberland) and at Gloup on Orkney. Common Rosefinches continued to underwhelm (literally and metaphorically) this week, with a paltry five birds reported. I can think of occasions in the last few years when I’ve had at least two grotfinches in my vegetable patch alone. Whatever’s up with them this year? One remained on Unst at Baltasound (Shetland) until 10th; elsewhere in Shetland one was on Fetlar on 8th and another graced Fair Isle on 8th-12th. Cornwall’s Cot Valley also had the pleasure on 9th-11th, with a further bird making the boat trip to St.Martin’s (Scilly) all worthwhile on 13th. Three Serins to report this week – one at Landguard NR (Suffolk) on 9th; another on 9th-11th on St.Mary’s (Scilly); and one in Norfolk at Winterton Dunes on 11th. Little Buntings mirrored Richard’s Pipits this week with a sizeable arrival of these charismatic and smart passerines. Numbers weren’t quite as massive as with aforementioned pipits, but there were some notable multiples amongst them. Small flockettes of Little Buntings? Crazy days. The week began fairly tamely in the Northern Isles, with birds settled on 7th-8th on North Ronaldsay (Orkney) and at Baltasound on Unst (Shetland). Nearby Fetlar (Shetland) hosted another individual on 8th. A further bird on Unst on 9th at Norwick preceded no fewer than three birds there alone on 12th-13th. Taking matters in chronological order, we move briefly out of Shetland on 9th-10th where one was to be found at Spurn (East Yorkshire). Things hotted up from 10th onwards. On 10th itself Shetland records came from Foula, Whalsay and Mainland at Eswick; one was on the Orkney mainland at Sandside Bay; another was trapped and ringed at Gibraltar Point (Lincolnshire); two single birds were on Scilly on Tresco and St.Agnes (present at the latter on 11th also); and one was on Mizen Head (Co.Cork). 11th saw three birds in the Standing Stones Field on St.Mary’s (Scilly), two birds at Bamburgh (Northumberland), and singles on Inner Farne (Northumberland) and at Donna Nook (Lincolnshire), and The Lizard (Cornwall). Two at least remained on St.Mary’s on 12th-13th, while there were three on 12th on Fair Isle (Shetland) and singles at Toab (Shetland), Kilnsea (East Yorkshire) while one of two present that day was trapped and ringed at Nanjizal Valley (Cornwall). On 13th two remained on Fair Isle while one was at Geosetter (Shetland) and one was on Portland (Dorset). A probable Rustic Bunting was on Lunna (Shetland) on 7th, with confirmed birds this week on 10th at Sandside Bay (Orkney), at Gibraltar Point (Lincolnshire) on 11th, and on Yell (Shetland) on 13th. A possible Pine Bunting at The Warren on Spurn (East Yorkshire) in the morning of 7th would have topped all matters bunting-related this week had it only stuck around – as it was, it inconsiderately flew off with some Yellowhammer and that was that – no further sign. One that quite literally got away. And those were your birds – some absolutely top drawer birding both in terms of volume and quality. The specifically predicted Isabelline Shrike and heavily alluded to Monster American Warbler Sp. both came good. What then of the coming week? We’re still firmly in the realms of possibility for another American goodie or two, with all sorts of mouth-watering hints from the past to draw succour from – plenty of warbler, thrush and cuckoo possibilities, and all sorts of leftfield monsters like Yellow-bellied Sapsucker. Specifically, what then? 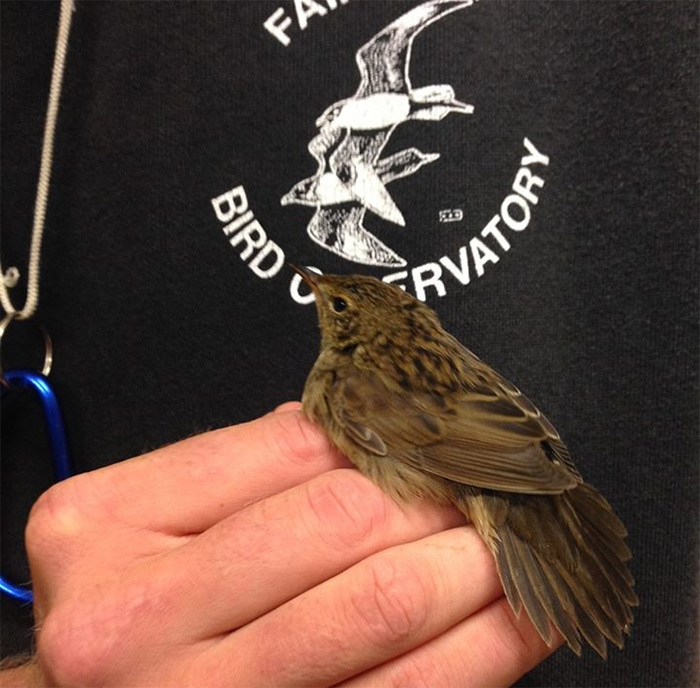 I reckon we’re overdue a good warbler – say, a Pallas’s Grasshopper Warbler. We’ve already had Siberian Thrush, albeit one way too brief for everyone’s liking – nobody would complain about another, but where’s the White’s Thrush? One of those too please. A decent wheatear or bunting seems likely – I’m settling for another Pied Wheatear and perhaps a cheeky Pine Bunting. And the week’s absolute, heart-stopping drop-everything bird? It’s gotta be a Siberian Blue or Rufous-tailed Robin. Thanks to all of this week's contributors for their photos and videos.